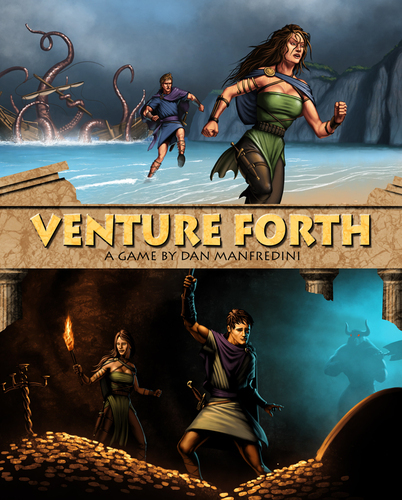 Venture Forth was published in 2012 by Minion Games. Across the realm, ordinary souls are longing for their dreams. Some seek wealth or power, others seek knowledge, but all pursue their own personal quest. Guiding your party, you populate a fantasy world with adventurers and enemies, recruit new companions, and venture forth out into the world of adventure! In Venture Forth, players have a party of adventurers who each have their own personal ambition. Achieving an ambition allows the player to convert that adventurer’s “will” into points and to possibly level him up. All ambitions require the player to venture forth, which means moving his party from one site to another along a path. One of the main actions in the game is playing an enemy or adventurer card to these path spaces. Once a path is completely filled in, any player can choose to venture forth down it and encounter each card one by one, recruiting adventurers, defeating enemies, and possibly gaining treasure along the way. A combination of resource management, path planning, and timing will help you along the way.